Chanterelles are a savory treat to unearth this summer. For those of us in Indiana from June to August, a golden treat makes its way up through the forest floor and into our markets, our restaurants and our homes. With a fruity apricot aroma and a peppery earthy taste, the trumpet-shaped chanterelle mushroom is a common but still prized find. 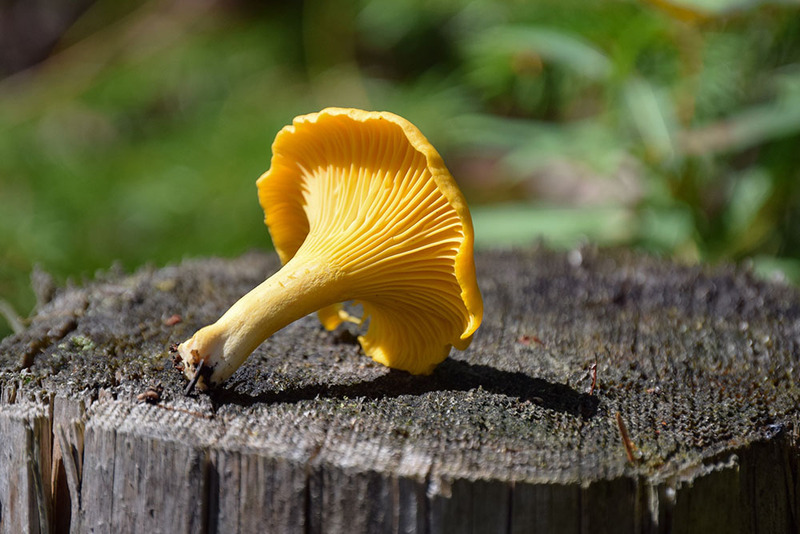 Mark Woten, from the Southern Indiana Mushroom Hunters, offers advice to get novice chanterelle hunters on the right path. Woten says a novice hunter’s best bet is Hoosier National Forest. The park’s many ravines are good spots for chanterelles as they generally grow on the side of a hill near a creek. The water that runs down shaded ravines keeps these areas dark and damp. With luck and patience, you’ll bring home a bag of chanterelles. But don’t make the common mistake of cleaning the mushrooms with water. “Water starts to bruise them almost immediately,” Woten says. “If you’re going to wash them, you have to use them immediately.” Instead, Woten says cutting the bottom of the stem will take care of the majority of the dirt. For the rest, use a soft brush. Store chanterelles in a paper bag in a cool, dry place. A plastic bag will retain too much moisture. When you’re ready to cook them, Woten recommends sautéing them in butter with salt and pepper. He says it’s the best way to appreciate the taste of this decadent mushroom. Never ever eat something unless you’re 100 percent sure what it is. A chanterelle look-alike, the highly poisonous Jack o’ lantern mushroom, could fool you with its dark orange color. Woten says to look for “gills” – the lines that run down mushrooms. While the chanterelle’s gills stop at the stem, the Jack o' lantern’s run all the way down. Woten says that’s a common distinction between poisonous and harmless, but not always. Better to be safe.